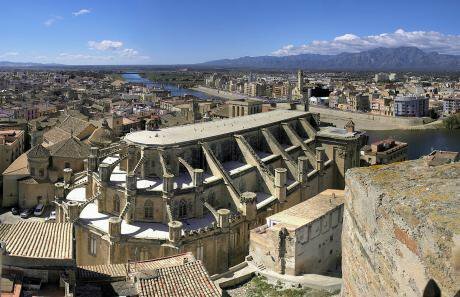 Tortosa, Catalonia, Spain. Wikmedia. CC.Catalonia’s independence referendum on 1 October this year brought journalists from the rest of Europe and beyond flooding into Barcelona, the regional capital. They heard Spain’s national government pronounce the referendum illegal and observed scenes of police brutality on voting day. If they stayed on for a while, they will have recorded the imprisonment of more than half the Catalan cabinet and the flight of deposed Catalan president Carles Puigdemont and several other ministers to Brussels, where they await a Belgian court decision on Spain’s request for their extradition. Reports on these events in the anglophone media have been mostly breathless, excited, misleadingly opinionated and depressingly shallow. Paul Mason’s piece in the Guardian is a partial exception - though it displays more enthusiasm for Catalan independence than understanding of the complexities. Crisis hardly seems an adequate word to describe the confusion, hurt, and anger prevailing both in Catalonia and in the rest of Spain. Nor is this an issue that fits neatly into conventional political categories of “left” and “right”. Political allegiances have fractured and others formed in defiance of formal ideologies. Opponents have found themselves sharing platforms, while allies have parted company. Nationally, the opposition PSOE (socialist) and the ruling Partido Popular (conservative) oppose Catalan independence. So too does the other major left-wing party - Podemos - which has resulted in a rift with Podem, its Catalan branch. Within Catalonia, the liberal CDC (Democratic Convergence of Catalonia) and DC (Democrats of Catalonia) joined forces with the ERC (Republican Left of Catalonia) and the MES (Left Movement) to fight the 2015 election as independentistas, while the local socialist (PSOE) and conservative parties among others campaigned as Spanish nationalists or españolistas. For the first time since the adoption of Spain’s constitution in 1978, Madrid has invoked Article 155 which allows the national government to assume direct control of “autonomous” regions. Its decision to do so in Catalonia and thereby effectively to overthrow the regional government has created a deep sense of unease especially though not only in Catalonia about the quality of Spain’s democracy. Fueling the disquiet has been the national government’s insistence on charging the deposed Catalan cabinet with rebellion, sedition and misuse of public funds - the first of these alone punishable by up to 30 years jail. It took a mere few hours of a federal judge’s time for her to jail the eight Catalan ministers who showed up for a preliminary hearing. Two leaders of pro-independence civil associations - Jordi Sanchez and Jordi Cuixart - are also in jail charged with sedition. People awaiting trial have been known to languish in prison for two or more years before their case comes to court. In the rest of Spain, harsh treatment of leading Catalan independentistas receives approval from much of the media and from a significant section of the population. While Catalan flags hang from balconies and windows throughout Catalonia, elsewhere in the country Spanish flags proliferate, and people on the street are happy to express on camera their view that the courts should lock up Puigdemont and colleagues and throw away the keys. Some have even suggested that the entire Catalan cabinet should be taken out and shot - idle rhetoric no doubt, but reflective of the strength of feeling among some ardent Spanish nationalists. More menacing, perhaps, is the warning issued at a press conference on October 9 by Pablo Casado, the governing party (PP) spokesman, that Puigdemont could “end up like Lluis Companys”. Companys, leader of the ERC and President of Catalonia before the Spanish Civil War, was executed by firing squad in 1940 on the orders of General Franco. Nothing, perhaps, better illustrates the disquieting nature of the current struggle than this dark reference to an atrocity - one of many - that occurred in the only country in Western Europe to remain under the control of a fascist regime after World War II. Catalonia was on the losing side of that bitter conflict, as it had been of others in previous centuries. “We Catalans harbour a sense of victimhood,” a historian in Tortosa told me. “We lost against Aragón in the 15th century, against the Bourbons in the 18th century, and against Franco in the last century. We’re accustomed to losing. And if we fight Madrid, we’ll doubtless lose again.” Firmly against independence, he saw the separatist movement as a simplistic means of complaining about the state of things. A fundamental tenet of Franco’s political credo was that Spain was and would remain eternally one country, a unified nation with a single language and culture. The dictator regarded pre-war Catalan demands for special recognition as an irritation, forbade use of the language in public, and dismissed calls for regional autonomy in terms not dissimilar to those employed by the current government. Not until the restoration of democracy in the 1970s, did Catalan culture and language begin to revive, and along with them came a growing demand for more political and fiscal autonomy. What has brought matters to a head - and unleashed the current independence movement - was Madrid’s effective suspension in 2010 of the Statute of Catalan Autonomy known as the Estatuto de Miravet. Building on two previous statutes, it had aimed to embed Catalonia’s status as a self-governing “nation within a nation”. Despite vehement opposition from the PP and its leader (now Prime Minister) Mariano Rajoy, by 2006 the Statute had achieved formal approval from both the local and national parliaments. Rajoy responded at once by embarking on a nation-wide campaign to undermine it; and by 2010 he had effectively succeeded in his aim. A year later, he became Prime Minister. A group of independentistas in Tarragona told me that resentment at Rajoy’s campaign against the Statute was widespread and had fueled demands for outright separation from Spain. Another source of discontent was that despite being responsible for over 20% of Spain’s GDP, Catalonia receives much less than its “fair share” of tax receipts. “Schools are being deprived of funds and infrastructure is beginning to crumble while other regions are prospering at our expense. We even have more toll roads than other parts of Spain because we have to pay for what they get free of charge.” Not everyone agreed with this account. One said that some regions of Spain were very poor and needed a higher level of funding than a rich region like Catalonia. “We shouldn’t be selfish”. Fresh parliamentary elections - called by Madrid - will take place in Catalonia on December 21st. Everyone I interviewed thought the most likely outcome would be a parliament similar to the one Madrid had deposed - with a slight majority in favour of independence. What then? The answer was unanimous: Rajoy would trigger Article 155 again, initiating a vicious circle in which a majority of Catalan voters would repeatedly defy Madrid’s instructions to choose political representatives of which it approves. So what is the solution,” I asked. At a lunch meeting in a village on the coast, a middle-aged couple, Andrés and Julia (not their real names), spoke at length of the police brutality they had witnessed on referendum polling day. They had managed to cast their votes without difficulty, but then watched horrified as television news reports showed police beating unarmed civilians with batons. “Most of the anti-independence sentiment comes from outsiders. Recent immigrants from other parts of the country,” Andrés said. On Tarragona’s Rambla, I came across three young women handing out leaflets on behalf of an organization called Recortes Cero (Zero Cuts) which campaigns for an end to austerity and a more equal distribution of income and wealth. “We are 100% against independence,” they told me. “Because its effect will be to impoverish the working class.” When I asked if they were working class, one of them said, “I’m a teacher which makes me middle class. But I teach working class kids.” The current front page of Recortes Cero’s website claims that 60% of Catalans oppose independence and that the deposed government’s independence declaration was anti-democratic. A student whom I interviewed subsequently made the same point. She told me the constitution of Catalonia stipulated that a major change in the law or in the region’s status required a two-thirds parliamentary majority, equivalent to 90 votes (out of 135) while the independence coalition in Puigdemont’s government could only count on 72. The referendum, therefore, was technically invalid both under Catalan and Spanish law (albeit for different reasons). My impression of Catalonia has always been and remains that it is a beacon of cultured, peaceful civilisation - a model of graciousness and human warmth. Catalans are far from agreeing on the tricky question of autonomy and independence, but I sense that a local referendum free from interference by Madrid would produce a result that most would be prepared to accept. So far, the Spanish government has resisted such a simple exercise in democracy; and in the guise of Jean-Claude Junker, the European Union has thrown its support behind Madrid. Both seem to me deeply misguided. Because the issue of Catalonian independence is one that violence, contempt and recourse to legalistic sophistry will never, in the end, succeed in repressing. It needs to be settled by the only peaceful means we have so far discovered for the resolution of political differences: via the ballot box.